Join us this summer in the beautiful mountains of Western North Carolina for a four week ballet intensive unlike any other. Ages 10 and up. Room & Board available. Admission by audition and DVD. BCA's Pre-Professional division prepares dancers ages 9 and up for careers in the dance profession, post-secondary dance programs and universities, conservatories, and other top pre-professional programs. Our classes for children 3 and up include ballet, pointe, modern, tap, broadway jazz, & hip-hop. Our talented young dancers often perform in the Nutcracker and Spring ballets. Children with a serious interest in ballet may want to learn more our Beginner Pre-Professional program. BCA offers boys ages 7 and up a robust program of dance. Our experience has shown that well-trained boys are often offered full scholarships to many of the finest summer intensive programs. Boys also play important roles in many of BCA's ballets, especially the Nutcracker. Our teens enjoy classes in ballet, tap, jazz, and hip-hop. These classes are open to anyone and include beginner and intermediate level dancers. Whether you're enrolled in our Children's program, our Pre-Professional division or just want to take a class for fun, dancers at BCA have one thing in common: They just love to dance. Don't Miss BCA's Nutcracker 2014! Join us December 17 at 6:30 and December 18 & 19 at 4:30 & 7:30 for BCA's holiday classic The Nutcracker. Featuring Julia Fleming and Rose Wuertz as the Sugar Plum Fairy, Blair Chamberlain and Caroline Roberts as the Dew Drop Fairy, Christopher Lynn as the mysterious Herr Drosselmeyer and talented dancers from our Pre-Professional division -- including Hannah Beun and Paige Kemper as Clara -- this holiday classic includes over 100 performers, lavish sets and costumes, and timeless favorites like Waltz of the Snow Flakes. There's even a classic battle between an army of Mice & Soldiers! Don't miss Clara's timeless adventures in a world of magic and beauty, a perfect holiday treat for the entire family. Tickets range from $15 to $28 and go fast -- call Diana Wortham Theatre at (828) 257-4530 or visit dwtheatre.com to reserve your tickets today. 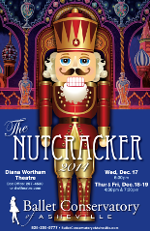 For a limited time, Nutcracker 2014 tickets are available at the BCA Front Desk. For more info, call BCA at 828-255-5777. The curtain opens to reveal the Stahlbaums' house, where a Christmas Eve party is under way. Clara, her little brother Fritz, and their mother and father are celebrating with friends and family, when Clara's mysterious godfather, Herr Drosselmeyer enters. He quickly produces a large bag of gifts for all the children. All are very happy, except for Clara, who has yet to be presented a gift. Herr Drosselmeyer gathers everyone around and tells the story of the Nutcracker and the Mouse King. The children are fascinated. Herr Drosselmeyer then produces life-size dolls, which each take a turn to dance. When the dances are done, Clara approaches Herr Drosselmeyer asking for her gift. It would seem that he is out of presents, and Clara, while still quite happy, gently hints to Drosselmeyer that she would like a toy. Drosselmeyer then produces a Nutcracker, in the traditional shape of a soldier in full parade uniform. Clara is overjoyed, but her brother Fritz is jealous, and breaks the Nutcracker. The party ends, the guests leave, and the Stahlbaum family goes to bed. After everyone is asleep, Drosselmeyer summons her in a deep sleep. She awakens and finds herself in her living room, but it has changed. Suddenly, a giant Mouse King and his minions of mice appear and frighten Clara. But Drosselmeyer's magic is powerful. A handsome Nutcracker appears and protects Clara. Then Drosselmeyer transforms Clara living room and her Christmas tree and gifts begin to grow right before her eyes! Then the Nutcracker calls for his army of soldiers. A fierce battle ensues and the Nutcracker and his soldiers are victorious. Clara thanks the Nutcracker. Then, Drosselmeyer, four beautiful Jewel Angels, and small Angels with guiding candles usher Clara into a mysterious world of beautiful dancing Snowflakes. The curtain falls on Act I. The Jewel Angels and small Angels arrive at the Kingdom of Sweets. They are greeted by the Dew Drop Fairy, a kind and beautiful fairy who rules the Kingdom. Drosselmeyer then arrives with Clara. In honor of Clara's heroic adventures, the Dew Drop Fairy presents her with a magical necklace. The Dew Drop Fairy then commands characters from the Kingdom of Sweets to perform several dances for Clara: a Spanish Dance, an Arabian Dance, a Chinese Dance, a Russian Dance, a Marzipan Dance, Mother Ginger's Dance, the Waltz of the Flowers, and the Grand Pas de Deux between the Sugar Plum Fairy and her Prince. After the Grand Pas de Deux, everyone dances a joyous Final Waltz. Drosselmeyer then appears for the last time and mysteriously transports Clara back to her house. She awakens out of her beautiful dream, safe and sound in her house, the Nutcracker in her arms. Please see Today at BCA or the BCA Calendar section for real-time Nutcracker 2014 rehearsals, performances and special events.